← Lyman County, South Dakota. June 21st, 2011. Cleveland, Ohio. June 21st, 2011. The collapse of an aging underground water/sewer tunnel section is to blame for a yawning chasm that opened Monday on Carnegie Avenue east of downtown Cleveland. A segment of the 84-year-old brick waterway beneath the busy street gave way, eroding the roadbed and eventually causing the asphalt surface to cave in. The result is a hole big enough to swallow an SUV, although the abyss didn’t claim any drivers before workers cordoned it off. Engineers are still assessing the extent of damage to the stormwater/sanitary sewer using remote cameras, Seifullah said. The collapse of the three-foot-diameter tunnel segment likely will require its replacement with a concrete pipe. If workers find no additional problems, the repairs will take about one week, he said. Crews will have to refill the 16-foot-deep cavity and repair the road’s surface. Traffic is reduced to one lane in either direction while the work is underway. While the culprit in this case was a defective pipeline, sinkholes can form from a variety of causes, both manmade and natural. Water is often the mechanism, whether from a broken main, an underground aquifer or stormwater runoff. If subsurface rock is water-soluble – such as limestone, carbonates or salt beds – the flow gradually can hollow out a void. Until the cavity reaches a critical size, the surface above remains intact, giving little warning of collapse. In 2004, Ohio Department of Transportation workers spotted a depression in a section of Interstate 480 westbound near Lee Road that signaled a potential sinkhole. Inspection crews found a damaged culvert that had eroded material below the pavement, said ODOT District 12 spokeswoman Jackie Schafer. They fixed the culvert, replaced and compacted the fill, and repaired the roadway. 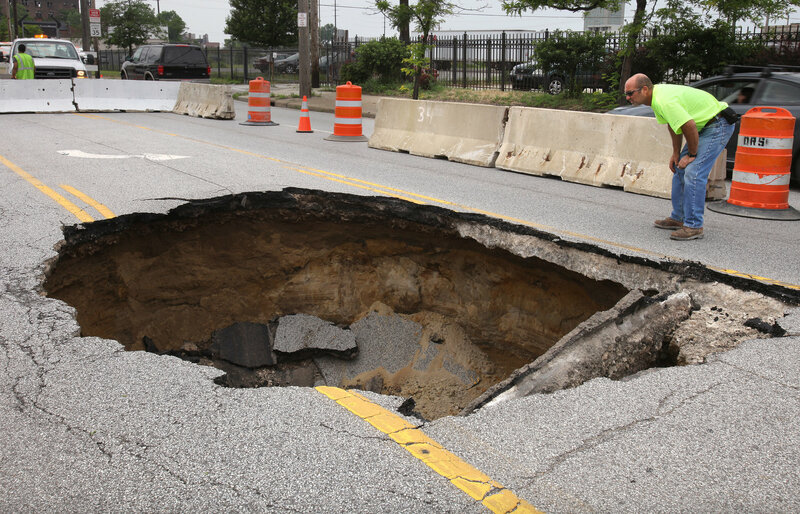 This entry was posted in Pictures and tagged Carnegie Avenue, Cleveland, Ohio, Ohio sInkhole, sinkhole. Bookmark the permalink. 1 Response to Cleveland, Ohio. June 21st, 2011. We have been told by our city officials, in Parma, Ohio (just south of Cleveland), that there is a sink hole on our street (Lincoln Avenue). An orange barrel has been covering the opening for nearly a year. The city cites that research is still being done, as to its repair. I am very concerned for the safety of our neighborhood. Especially, since it has been there SO long. It is a heavily traveled street and traffic routinely passes on both sides of the barrel.